The best way to described M&Ms with the chili is that they went and coated a nut with a surprising bit of heat. It can take a second for the hot-feeling to start, but once it kicks-in don't be surprised if you actually want a glass of water! A coffee nut M&M has the same crunch as the other nuts, but also includes a surprisingly strong essence of coffee that mixes with the chocolate and produces a cool flavor almost reminiscent of a mocha. 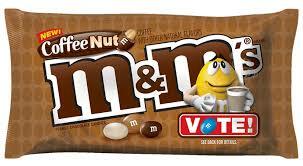 This flavor has of course existed a looooong time, but people can actually vote for it too. I guess this is like the, "Protest," vote for people who didn't like any of the new flavors and want to make that extra-clear? Note that if you dislike coffee, you may very well hate it. I gave my mother-in-law these M&Ms to try and she thought the chili and honey nut were perfectly average but had to go and spit-out the coffee nut M&M due to her having a burning hatred for all things coffee-related. That said, I loved this flavor, and have already voted for it. I encourage you to try the three options out too and tell the company which is your favorite...although I'd obviously prefer for you to vote with me on team coffee-nut. Still, it's your choice, just please don't pick honey.